Flow chart of study design. EoT: end of treatment. 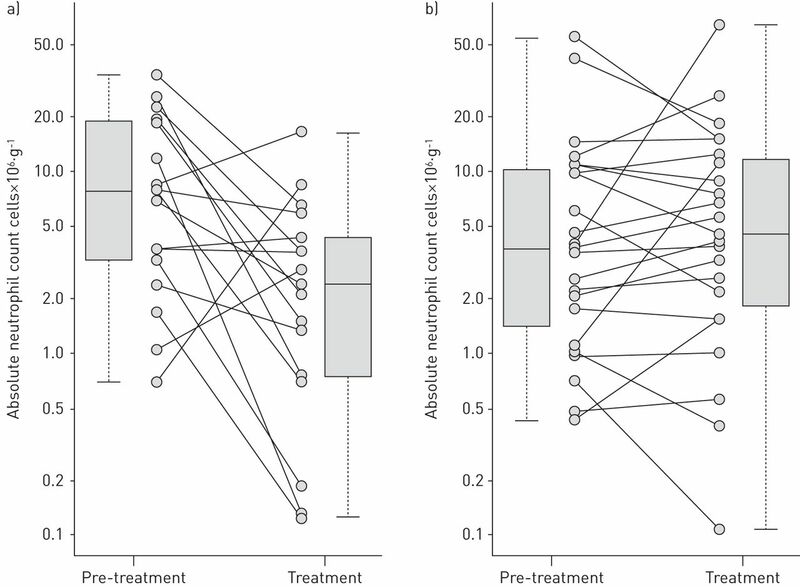 Changes in sputum neutrophils in the a) AZD5069 80 mg twice daily and b) placebo groups. 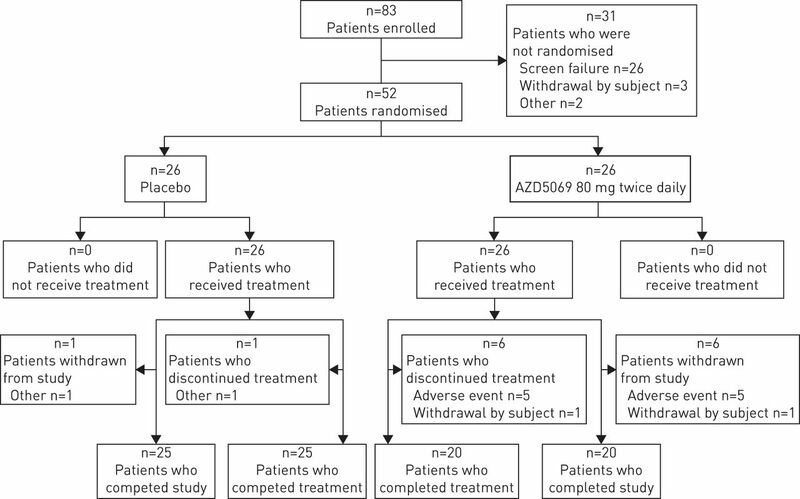 A 69% reduction of sputum neutrophils was seen in the AZD5069 group compared with placebo. Baseline was calculated as the geometric mean of results obtained at visits 1a, 1b and 2. End of treatment was calculated as the geometric mean of results obtained at visits 3a, 3b and 4. The expected improvement is a decrease in absolute neutrophil counts. One-sided p=0.002. Change in St George's Respiratory Questionnaire for chronic obstructive pulmonary disease patients (SGRQ-C) total and domain scores from baseline to end of treatment (difference (90% CI) between AZD5069 80 mg twice daily and placebo). Difference and 90% CI were obtained from an ANCOVA including terms for treatment, inhaled corticosteroids, Pseudomonas aeruginosa infection and baseline. Data are presented as n, mean±sd or n (%). BMI: body mass index; FEV1: forced expiratory volume in 1 s; COPD: chronic obstructive pulmonary disease. #: duration of bronchiectasis is calculated as the date of screening minus the date bronchiectasis first appeared; ¶: used by >15% of patients. Geo mean: geometric mean; CV: coefficient of variation; IL: interleukin; MCP: monocyte chemotactic protein; TNF: tumour necrosis factor; GRO: growth-regulated oncogene. Geo mean: geometric mean; CV: coefficient of variation; CRP: C-reactive protein; IL: interleukin; GRO: growth-regulated oncogene; TNF: tumour necrosis factor; SAA: serum amyloid-A. Data are presented as n or n (%). Patients who had at least one adverse event in any system organ class, presented in order of decreasing frequency (sorted by total number on AZD5069 80 mg twice daily) using MedDRA (version 14.1; www.meddra.org).